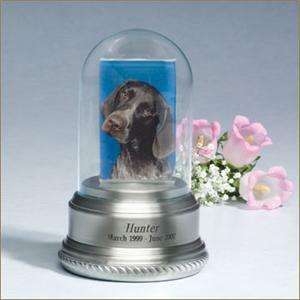 A glass dome atop an engravable spun pewter base protects the 2" Wide x 3" High acrylic frame that holds a favorite photograph. You may further choose to personalize this urn by also engraving your pet's name at an additional charge. Closure: Bottom-opening plate attaches with screws.